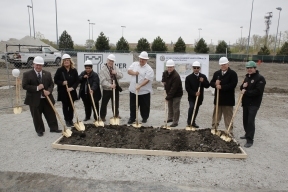 Town President Larry Dominick was joined by the Town’s Board of Trustees and major Department heads on April 26th to officially announce the construction of a new Waggin’ Tails Animal Shelter located at 18th and Laramie just south of the current facility. The new Community Park (similar to the Town’s Community Park at 34th and Laramie) will be called the Cicero Campus Park serving the entire region. The new Animal Shelter will feature a state-of-the-art, 6,500 square foot animal shelter to replace the existing one. It will offer separate staging areas for the intake of new dogs and new cats, separate housing areas for dogs, and cats, separate care areas with two adoption rooms (social rooms) where families adopting pets can spend time and socialize and get acquainted with the pets before taking them home). 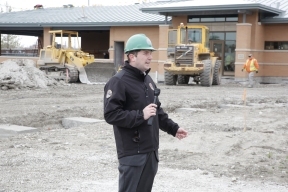 The new Animal Shelter is located at the end of the new larger park area which will also include an outdoor, 2,500 sq ft dog run, and a dog park, one for small dogs and one for large dogs, similar to outdoor dog parks located in many other communities. The new park will also be welcoming to families and feature volleyball courts, a fitness area with basic exercise equipment, a jogging area that will connect and expand the existing jogging area at Clyde Parks’ “1808 S. Laramie” Park (just to the south of the new park. There will be a bean bag playing court, and a state-of-the-art skate park for teenagers. There is a play area for younger children, and a parking access area along Laramie Avenue. The park area will also connect to the large soccer fields at the 1808 S. Laramie Park.